I will never forget the day my biggest fear as a photographer was realized. It was gut-wrenching. And as much as I had feared this happening, there was nothing that could prepare me for the unfathomable sickness I would feel in the pit of my stomach when it happened. I was shooting a wedding, and my equipment failed at a critical moment. The bride stepped into the doorway at the back of the church, ready to take her long-anticipated walk down the aisle, and in that moment, I saw the flashing red warning that would send a solid rock of horror right into the pit of my stomach: Memory card failure. That dreadful moment put into perspective everything I knew about the importance of being prepared as a photographer. I had no time to contemplate alternatives. There wasn’t time to switch out cards. There was only time to grab my second camera just inches away and keep working. But what if I hadn’t had that second camera ready to go? What if your battery dies or your card fills up in the middle of the first dance and you don’t have a spare on you? These critical moments show us just how important it is to be prepared at all times. The reality is, that if you are a photographer for any length of time, something will happen. Equipment will fail, someone won’t show, something won’t work as it’s supposed to… And it’s our job to be prepared for it. These are three tips to help you be prepared, so you can avoid a catastrophe when things go wrong. Backup, backup, backup. I cannot stress the importance of having extra memory cards and batteries on you at all times. If you are a portrait photographer, you can get away with keeping them in your camera bag, as long as your bag goes on location with you. But if you are shooting a wedding, it’s best to have them physically on your person so that you can access them quickly throughout the day. Weddings are fast moving and have little time for disruption in the schedule. Save yourself the trouble of having to find your bag and dig through it at the moment you need another battery or card. When I shoot or second shoot weddings, I make sure to wear clothing that has pockets to carry these things. 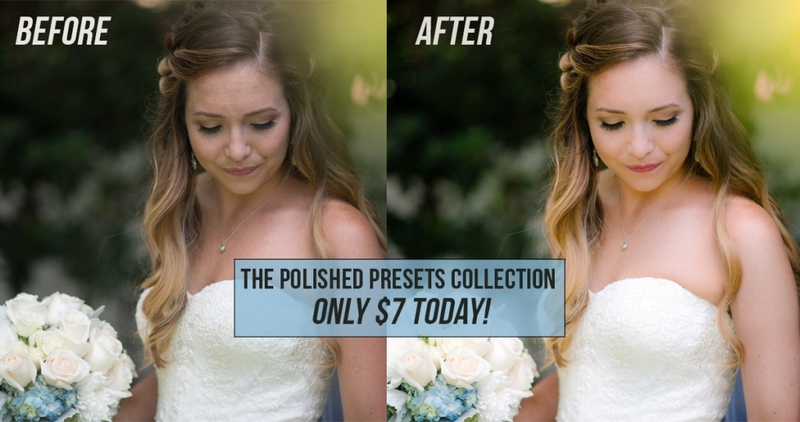 Give Your Images the Final Touch They Deserve With Our Polished Presets – At Only $7, They Are a Must Have for Every Photographer’s Toolbox! For wedding photographers, it’s also critical that you have a second camera body for back up. I will never forget the very first time I was a second shooter for a wedding. The primary photographer was a friend of mine, and we were out on a farm in the mountains doing bridal and bridal party portraits, far from anyone else or the rest of our equipment. In the middle of shooting, my friend’s camera died. It completely died. Without warning. Thankfully, I was able to casually swap cameras with her and we continued on, her shooting with my camera, and me pretending everything was normal and fine until we could get the issue resolved. We should have had backups with us in that moment. Not displaced somewhere like an unimportant formality. Because what good is backup equipment if you can’t access it when you need it? I can’t express enough how important it is to know and understand your equipment inside and out. Know what the error messages mean, know how to adjust when something isn’t quite right. The stress of a photo session or a wedding day has a way of skyrocketing our nerves and keeping us from being able to think completely clearly when something goes wrong. But if you know that you know that you know your equipment, you can rest assured that any hiccups can be resolved quickly. Also, let’s face it: we photographers love new equipment, right? I love the appeal of something new, new tools to help me get the job done and get it done better. But a word of warning with new equipment: before you take those tools out in the field, be sure you know how to use them fully and properly. The last thing you need is to be faced with an equipment issue that could have been avoided because you’re using something you aren’t familiar with. When that bride started making her way down the aisle and I had a flashing red warning in my face, my heart sank and my stomach hurt. But my face said nothing. When I was second shooting with my friend and her camera died on that mountain, she may have quietly whispered a call of distress to me under her breath, but it was after she gave the girls direction to gather into a group and walk away from us for a shot. Thankfully, with their backs to us and long lenses keeping us far from them, we were able to swap cameras without making a scene. No one ever knew. And while my friend wanted to curl up and cry under the stress of it all, she remained calm and collected and the bride never knew a thing had gone wrong. The easiest way to be able to stay calm in the face of any sort of malfunction is to be prepared for it. When you are prepared, when you have a plan, you are less likely to get rattled. If that battery dies in the middle of an important moment, having a spare in your pocket will save you from the stress of trying to find your bag and dig for one. Understanding the equipment you are relying on will keep your nerves calm when that equipment isn’t doing what you want it to do. The best thing you can do to set yourself up for success is be prepared for anything. As a professional, your clients expect it. And by always having backups on hand, knowing your equipment, and preparing yourself enough to not be shaken when something goes awry, you can ensure you are delivering the level of professionalism that your clients expect. Thanks for the very helpful information. I’m still pretty new to photography and who knows where my passion and love of photography will take me down the line. When i did weddings 20 years ago with film cameras multiple cameras were a must. We were limited to 36 exposure film rolls. I would be switching cameras to keep shooting while an assistant reloaded. Once in a while somethingvwould break with those manual cameras. Sometimes flashes stopped working. Always concerned something would break or get fouled up like the film wasn’t advancing during the ceremony. Don’t miss those days. O. M. G is this good advice. Oh and the other critical thing is to back up back up back up those images! I need to have a spare battery.. I was shooting while travelling when all of a sudden the battery icon just flashed thru the screen and i didn’t have any back.up with me. I just used my phone instead while I put my camera off. Lesson learned: the next time I travel, i have to bring another batt or a 2nd cam..